I travelled to Bali for a two-week holiday in 2007. My first time on the island then, I decided to arrange for an airport transfer. The guide who brought me to my hotel subsequently helped me with my itinerary. It helped that I had a basic list of things to do and places to visit. Also, the fact that I had fourteen days meant that my schedule and itinerary could be flexible. Agro-tourism plantations, where I learnt to dislike Balinese coffee, made of over roasted, tasteless Robusta beans. The good thing about travelling with a guide is that they are able to plan your travels and make the most out of the day, traversing the island in a very efficient manner. Being unfamiliar with the island may mean crossing the island in haphazard directions, or arriving at a place too early, too late or too crowded. Unless of course, you have equipped yourself with an armful of travel books and has set a well-planned itinerary weeks before. Otherwise, it may be wise to go with a guide, which is very affordable and always very friendly: it’s the Balinese temperament. Waiting for my flight at Changi Airport and hating the strict enforcement of carry-on luggage weight-limit. First night's dinner ; a whole fish set dinner for S$7! Souvenir from Jenggala Keramik of my first trip to Bali. 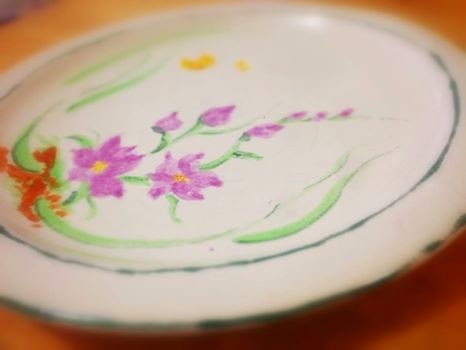 Day 1: I made myself a self-painted ceramic plate at Jenggala Keramik the last time I was there. In my impression, it took three days to deliver, so I thought the place should be first on my itinerary. Unfortunately, they’ve changed their policy to four to five days and the fact that my visit was over a weekend meant that it was impossible to do this again this time around. Thus, I settled for one of their well-made plates and a watercolour sketch of their place. The headquarters and showroom of Jenggala Keramik at Jimbaran. Lunch was next. It was an exploratory trip on the way to Ulu Watu and it was settled at this restaurant at Nusa Dua. Food is always affordable at Bali. An overwhelming meal at a restaurant is almost always just a few dollars in the teens. Yup, it’s THAT affordable. The trail along the fortified cliffs of Uluwatu. A small forest lies at the front and hundreds of monkeys dwell here. They are believed to guard the temple from bad influences. In reality though, be very wary of them: they are known to grab anything attractive to them from you. Concrete walls on the cliff side fortify the serpentine pathway to the temple. It takes about an hour to get from one end to another as there are several fenced points along the way to stop. The views from the bottom of the water surging up against rocks and the ocean horizon are remarkable. The Kecak performance (about S$10/entry) at sunset. The temple ground is also where the Kecak Balinese dance and music drama, developed in the 1930s in Bali, is performed. Done primarily by men, it is also known as the Ramayana Monkey Chant. The piece, performed by a circle of 150 or more performers wearing checked cloth around their waists, percussively chanting "cak" and throwing up their arms, depicts a battle from the Ramayana. The monkey-like Vanara helped Prince Rama fight the evil King Ravana. Kecak has roots in sanghyang, a trance-inducing exorcism dance. Breakfast by the padi fields along the way to Tanah Lot. P.S. The food may induce instant diabete. Proceed with caution. The temple is isolated from the mainland during hightide. Tanah Lot is claimed to be the work of the 16th-century Priest, Dang Hyang Nirartha. During his travels along the south coast he saw the rock-island's beautiful setting and rested there. Some fishermen saw him, and bought him gifts. Nirartha then spent the night on the little island. Later he spoke to the fishermen and told them to build a shrine on the rock for he felt it to be a holy place to worship the Balinese sea gods. At the base of the rocky island, poisonous sea snakes are believed to guard the temple from evil spirits and intruders. A giant snake purportedly protects the temple, which was created from Nirartha's towel when he established the island. The area leading to Tanah Lot is highly commercialized and people are required to pay to enter the area. A quieter spot on the same grounds as Pura Tanah Lot. This temple gets its name from the unique rock formation on the cliff which it stands. A five-minute walk from Pura Tanah Lot, is the quieter Pura Batu Bolong. As the name implies, the temple is located above the black rock of Senggigi Beach which has a hole carved by the waves. With its position that juts into the sea, of course, this temple has its own atmosphere of beauty: quiet, serene, solitude. Lunch at Waroeng Made Becik upon arrival at Ubud. The music, the breeze, the palms, the lull. Known as the "Mother Temple" in Bali, Pura Besakih is situated 3,000 feet up the slopes of Mount Agung in East Bali. Pura Besakih, considered the most important Hindu temple in Bali, is actually a complex of 23 separate temples that can be explored by tourists. The Pura Besakih temples are thought to date back to the 14th century, however some locals date them back as early as the 10th century. Captivating view of the multilevel temple complex that is Besakih. Constructed on six different levels, Pura Penataran Agung is the epicenter of the temple district. White banners flying around Pura Penataran Agung denote the temple's dedication to Shiva. Pura Besakih, famous for allowing Hindu followers from any caste to worship, draws worshipers from all over the world. Guides are not necessary: Locals will tell you that certain temples are "closed" or that you must hire a guide to see "sacred" parts of the temple. Nearly all of the Pura Besakih temple precinct can be explored independently. Unofficial guides may demand a tip to continue halfway through your tour. Bring your own sarong: Proper dress is expected inside of Hindu temples; men must cover their legs with a sarong. Sarongs can be rented at the entrance of each temple, however purchasing your own in Ubud is a better idea. Do not overdo donations and do not feel obilgated: Upon entering each temple, you will be pressured to give a donation. A logbook of previous guests will show exorbitant amounts of $10 - $40. A typical donation to other Hindu temples in Bali is typically around $1. Expect inflated prices: Food, drinks, and souvenirs around the temples are outrageously priced - wait until you return to Ubud to enjoy delicious Indonesian food. Dinner at Cafe Wayan, Ubud: it's like dining in a garden. Woke up to the call of nature: country stay means morning calls by roosters are included free of charge. But the Balinese garden view glistening with morning dew makes it worth the while. Tegalalang: this beautiful, serene iconic symbol of Balinese rice agriculture is now used as a spot to cultivate a different type of crop: tourist commercialism. Day 3: Tegalalang Rice Terraces in Ubud is famous for its beautiful scenes of rice paddies involving the subak (traditional Balinese cooperative irrigation system), which according to history, was passed down by a revered holy man named Rsi Markandeya in the eighth century. Tegalalang forms the three most splendid terraced landscapes in Ubud's shared region, with the others being in the villages of Pejeng and Campuhan. However, only at this terrace can one enjoy a view that spreads down and away to the rice terraces on the slopes across the valley. Tegalalang: a money-making tourist spot. The spot is now a money-making tourist spot of course. It is now longer used to produce rice. Instead, a different kind of crop, the commercial kind, is cultivated here. Face of the granite cliff with five candis. A picturesque tomb with a lily pond in the foreground. Gunung Kawi Temple is a collection of ten candi (shrines), created to evoke the appearance of temple fronts and designed to provide residence for the souls of ancient kings. The candi are hewn into the valley walls on both sides of the holy Pakersian River. The river flows through the centre of Gunung Kawi, cutting the site into two separate sections with a bridge connecting one side to the other. It is believed the holy waters of the Pakerisan sanctify Gunung Kawi, and the beauty of the place evokes a relaxing and peaceful atmosphere. Inscriptions over each candi approximate the date of construction to be in the 11th C. It is believed that each temple served as a memorial to a deified royalty principally because they are shaped like the burial towers, or Candi’s, found throughout Central Java. But in Java they are free standing whilst those found at Gunung Kawi are actually hewn relief's in solid rock. While the exact origin of the candi is unknown, there is evidence to suggest that the first set of five were built to honor King Anak Wungsu, whose rule over central and east Bali extended from AD 1050 to about AD 1080. It is possible that one was built for him and the other four for his wives, who would have ceremonially committed suicide after his death. On the east side of the river are situated five candi which constitute the main group in this complex. Across the bridge are four candi on the west side. The remaining candi at the southern end is often referred to as the ‘tenth tomb’. At the bottom of the stairway and to your right-hand side through a small field (about one kilometer) is where the tenth tomb is located. The legend to this amazing place is intriguing. It is believed that the mythical giant Kebo Iwo carved out all of the ancient tombs in one night with his fingernails. Behind the small temple you can find a couple of meditation caves, which indicates that this is a pre-Hindu place where monks and pilgrims came together to meditate. This trip marks my second visit to the island. I have a better understanding of the place. Thus, if I should visit again, it would not be for the attraction spots, but the siren lull of the island. Ubiquitous Balinese gamelan music forms the soundtrack of the island. Abundant and lush vegetation of coconut palms and rice swaying in the breeze is the picture, the landscape scenery. It will be for these that I visit, should I visit ever again. ## All black and white pen drawings: Platinum Preppy pens with Atramentis Archive Ink on Stillman and Birn Beta A5 landscape hardbound.